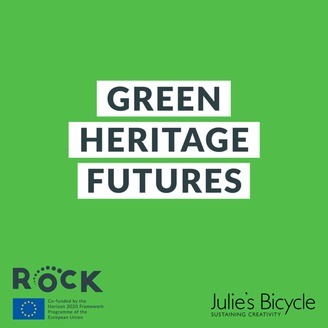 Green Heritage Futures is a podcast exploring cultural heritage and climate change. Julie's Bicycle Project Manager Lucy Latham sits down each month with a figure working at the intersection of cultural heritage and climate change to explore their projects and perspectives. The series looks at the importance of protecting cultural heritage in the face of climate change, as well as the unique opportunities of cultural heritage in engaging citizens and driving environmental solutions. Julie’s Bicycle is a London based charity that supports the creative community to act on climate change and environmental sustainability. Like the podcast? Tell us what you think on Twitter @JuliesBicycle and hashtag #GreenHeritageFutures. 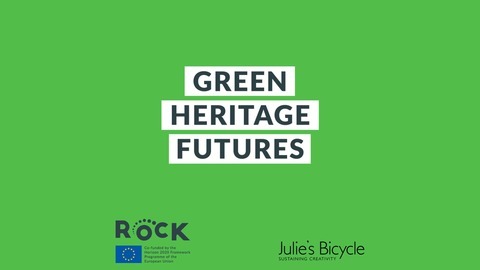 This podcast is part of ROCK, a project focusing on historic city centres as extraordinary laboratories to demonstrate how Cultural Heritage can be a unique and powerful engine of regeneration, sustainable development and economic growth for the whole city. This project has received funding from the European Union’s Horizon 2020 research and innovation programme under grant agreement No 730280. The content of this podcast reflects only the views of the speakers. The Agency is not responsible for any use that may be made of the information it contains. We speak to Miranda Massie, Founder and Director of the Climate Museum to find out more about her work and what she's learnt through her experiences. We explore her path to founding the Climate Museum, the unique nature of culture that lends itself to understanding and coming to terms with central issues in climate change, and why museums are such powerful institutions in addressing the climate crisis. For more information on the podcast and our other work, visit our website at https://www.juliesbicycle.com/ or follow us @JuliesBicycle. You can find Miranda on Twitter @mirandaksmassie. Find out more about the Climate Museum at https://climatemuseum.org/ or @ClimateMuseum. Find out more about Climate Speaks, the youth spoken word programme initiated by Climate Museum, at https://www.climatespeaks.org/. This podcast is part of ROCK. Find out more at http://rockproject.eu/ or @ROCK_H2020. This project has received funding from the European Union’s Horizon 2020 research and innovation programme under grant agreement No 730280. The content of this podcast reflects only the views of the speakers. The Agency is not responsible for any use that may be made of the information it contains. Thanks for listening! If you enjoyed the podcast, please share it with anyone you think might like it or find it useful.